Beginning with vSphere 5.1, VMware introduced LACP support on vSphere Distributed Switch (LACP v1), to form a Link Aggregation team with physical switches. LACP is a standard method (IEEE 802.3ad) to control the bundling of several physical network links together to form a logical channel for increased bandwidth and redundancy purposes. LACP enables a network device to negotiate an automatic bundling of links by sending LACP packets (LACPDUs) to the peer. Compared to Static EtherChannel (sole possibility in vSphere ≤ 5.0), LACP has some significant benefits like failover or avoiding misconfigured and non-matching device-to-device settings. vSphere supports only one LACP group (Uplink Port Group with LACP enabled) per distributed switch and only one LACP group per host. This means that you cannot override load balancing configuration for a portgroup: as I would not recommend EtherChannel/LACP for VMkernels (except for NFS, and only with a good design), this impact would imply to separate traffic types in different Distributed Switches, which may not be possible in the context (due to constraint or requirements), or undesired for manageability. But this was for LACP v1. Enhanced LACP Support (LACP v2) on VMware vSphere 5.5 (released in september 2013) introduces a larger set of features to improve dynamic link aggregation flexibility compared with vSphere 5.1 and address the gaps with competitors. The biggest difference into the fact that multiple LAGs can now be created on a single Distributed Switch. In vSphere 5.1, only one LAG can be created per vSphere Distributed Switch. 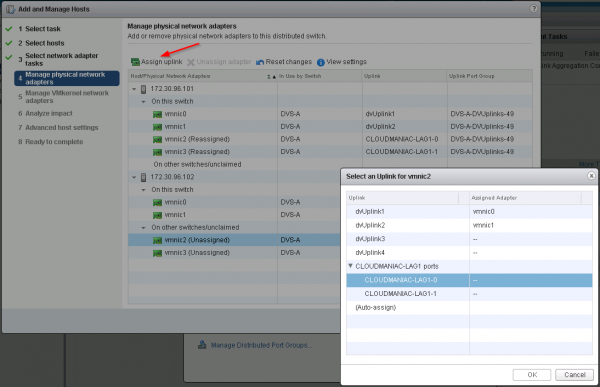 In vSphere 5.5, up to 64 LAGs can be created per vSphere Distributed Switch. 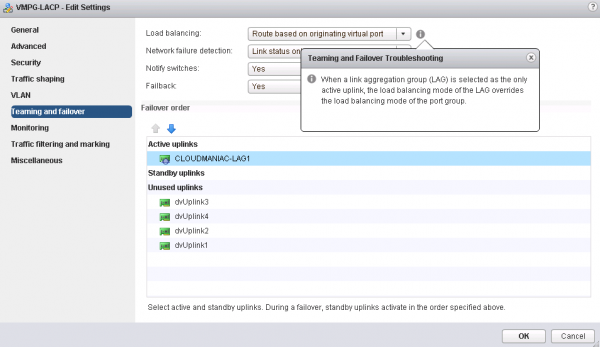 Furthermore, another enhanced LACP feature in vSphere 5.5 is the support for all LACP load balancing types (20 different hash methods). 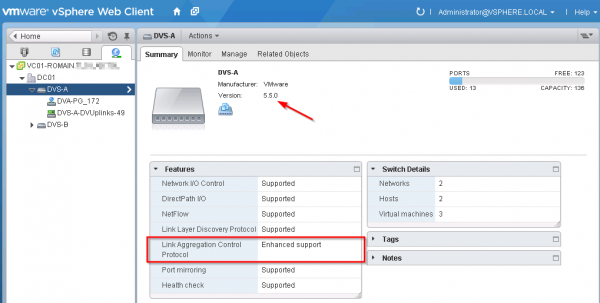 First, take a look at your VDS: Enhanced LACP Support requires Distributed Switch in version 5.5.0. The next step is to create a new Link Aggregation Group in “Manage > Settings > LACP > New Link Aggregation Group” (via the green cross). You need to define at least a name, the number of LAG ports (24 max. ), the LACP mode and the load balancing mechanism. You can create up to 64 LAGs per VDS. Active – The port is in an active negotiating state, in which the port initiates negotiations with remote ports by sending LACP packets. Passive – The port is in a passive negotiating state, in which the port responds to LACP packets it receives but does not initiate LACP negotiation. Note: These policies are configured for a LAG. Depending the context, you may now migrate network traffic to this new LAG, or add host to the Distributed Switch. 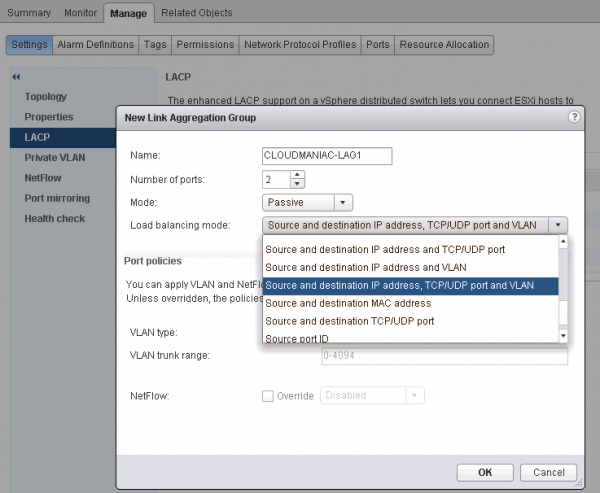 I will not cover the details of the migration to LACP in this post, but one of the required step is to change your existing distributed portgroups configuration (or create new ones) to move the newly created LAG group to “Active Uplinks“. The LAG is represented as an uplink like any other physical NIC and can be selected in the failover order configuration. Additionally, you can notice the warning on the load balancing drop-down menu: the load balancing policy is rendered useless by the LAG. If you try to keep standalone uplink(s) in Active or Standby, the system will warn you and prevent you from continuing: indeed, mixing LAGs and standalone uplinks in a portgroup is not supported. for each desired vmnic, use the “Assign uplink” button the assign the physical uplink to the LAG ports. Note: you can notice that LAG ports were automatically suffixed (-0 and -1). Finally, if you go to “Your VDS > Manage > Settings > Topology“, you will have a nice graphical representation of the result. 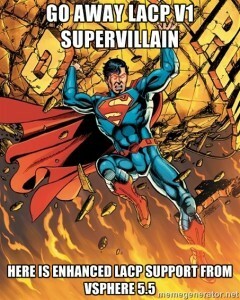 LACP support is not compatible with software iSCSI multipathing. iSCSI multipathing should not be used with normal static etherchannels or with LACP bonds. LACP teaming does not support beacon probing network failure detection. LACP configuration settings are (still) not present in Host Profiles. 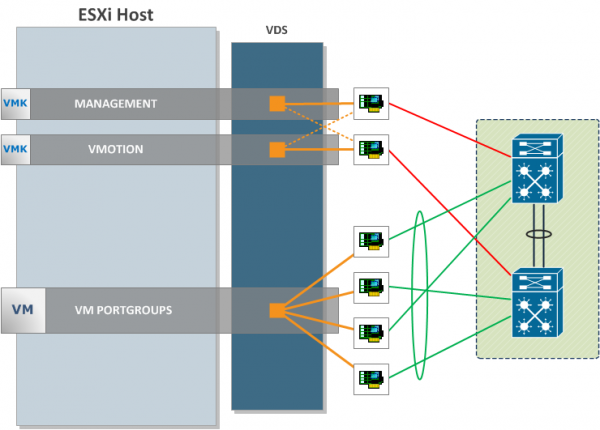 LACP support between two nested ESXi hosts is not possible (virtualized ESXi hosts). The enhanced LACP support is limited to a single LAG to handle the traffic per distributed port (dvPortGroup) or port group. You can create up to 64 LAGs on a distributed switch. A host can support up to 32 LAGs. However, the number of LAGs that you can actually use depends on the capabilities of the underlying physical environment and the topology of the virtual network. 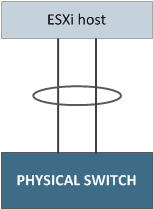 For example, if the physical switch supports up to four ports in an LACP port channel, you can connect up to four physical NICs per host to a LAG. Source: Limitations of LACP in VMware vSphere 5.5. Although this feature is not the answer for all your network problems, the Enhanced LACP Support is a huge step forward in vSphere 5.5. For example, you could have in the same VDS the Management and vMotion VMkernels in a double Active/Standby configuration, and a LAG group of 4 ports to serve Virtual Machines traffic. In vSphere 5.1, you would have either to divide this into two VDS, or use LACP for all network traffic types. Great post. I’ve been reading various blogs and had discussion with VMware and my networking team regarding LACP in our new datacenter. Can you expand on your reason for not using LACP in a blade (non-UCS) environment? Is it due to the fact that on UCS you can split the converged LOMs and still do LACP for certain traffic while on other vendors you either have two converged LOMs or can split the LOMs but not use LACP (HP Virtual Connect)? Can you elaborate a little bit more on why you wouldn’t want to use LACP on vmkernels? I’m sorry to reply so late. For VMkernels, reason is that you might want to decide which uplink the VMkernel will use while with LACP you don’t choose at all. You say: “(Unfortunately) LACP is not included in Standard vSwitch and requires Distributed Switch, so you need Enterprise Plus licenses,” but that is not entirely true. Yes, LACP requires Distributed Switch but Distributed Switch is included with a VSAN license which doesn’t require an Enterprise Plus licenses. Hi Kevin. Indeed, now the Distributed Switch feature is included with VSAN license, but it was not the case at the time of the writing. I’ll update the article to add this precision. So I tried to enable LACP on two new nics and I took down my whole environment. I had an existing DVS with 4 uplinks and 300+ portgroups. Those uplinks are portchannelled on the switch. I created the LAG and moved it to the standby position for all portgroups and that took down everything. Remember that the Standby position is explicitly NOT supported with LAG whatsoever. If you want to test migration – I believe the supported path is to move the LAG to the Active position, and all other uplinks to the Unused position. Support does depend on the DVS version – but I believe that in 6.5 at least it is fully supported to configure this on a per-port-group level. This should allow you to test proper connectivity and configuration without taking down your production environment. As a side note – stuff like this is precisely why every environment with more than 3 hosts should spring for some lab gear: A pair of cheap used lab hosts with trial licenses would be enough to support pretty much every major systemwide change or feature in VMware. Only 2-3 hosts? Use standard vSwitches and features – KISS. It will not increase speed / throughput. You will still have a 1Gbs link in your VMs. I suggest you to document yourself more on LACP in general before adopting this feature.